All is quiet now, but for the last few days (and nights!) 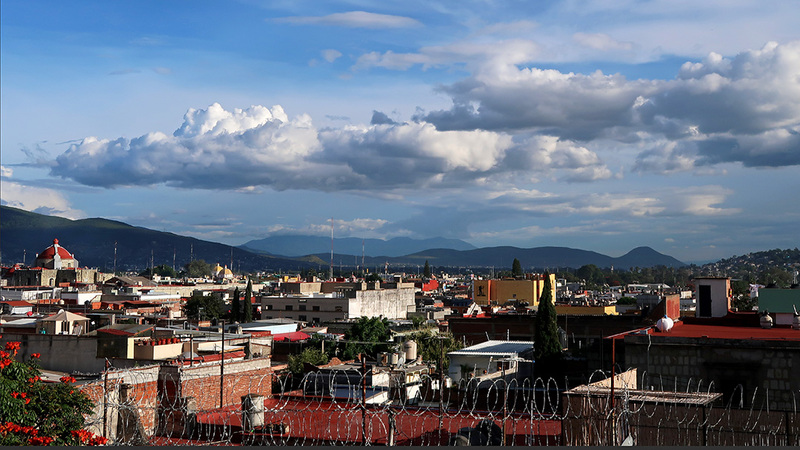 there has been no solitude for Soledad, or her neighbors (of which I am one). 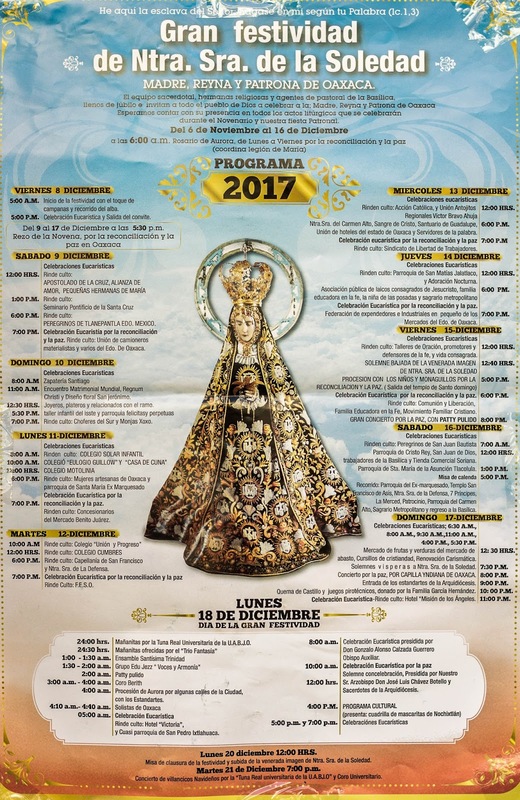 For several days leading up to December 18, the feast day of the Queen of Oaxaca, La Santísima Virgen de La Soledad (Virgin of Solitude), Oaxaca has been celebrating. 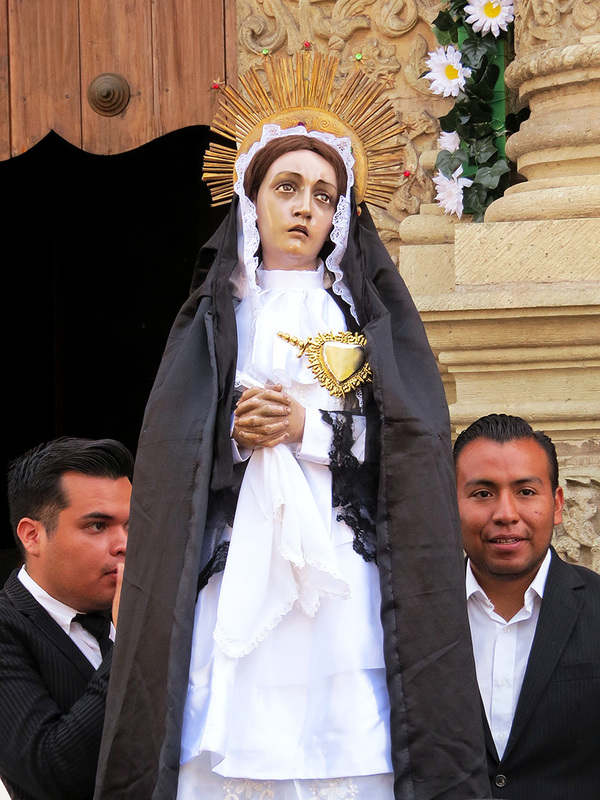 For those unaware of this virgencita, Soledad is adored and venerated in a manner similar to the Virgin of Guadalupe and is carried through the streets of Oaxaca (both city and state) during many religious celebrations. 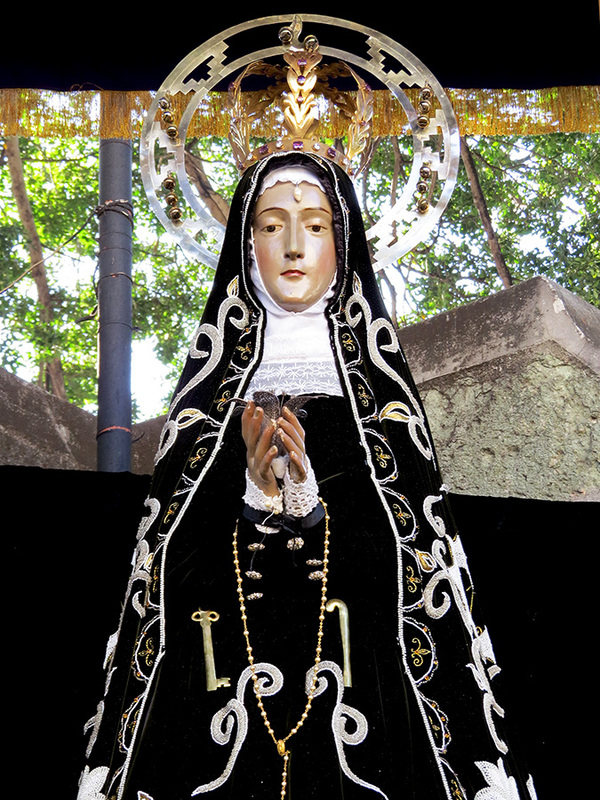 She resides in the church dedicated to her, the Basílica de Nuestra Señora de la Soledad. 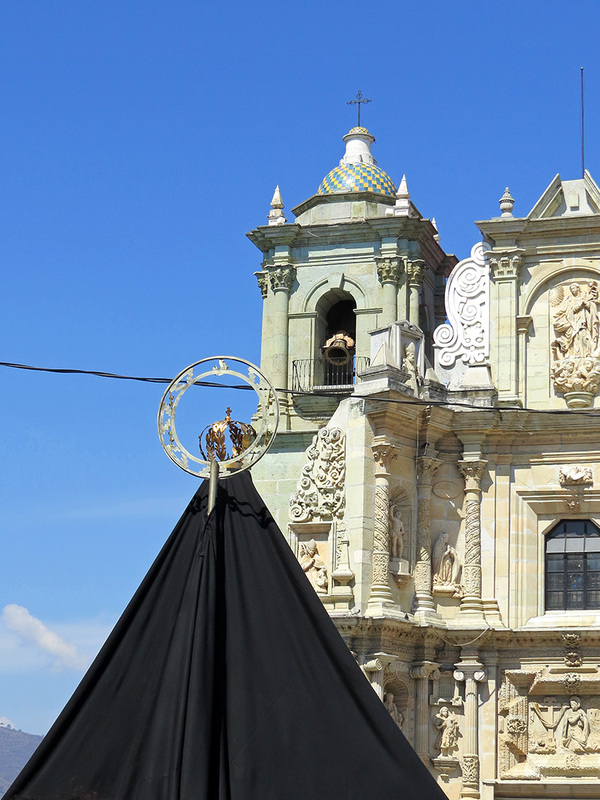 Designed by Father Fernando Méndez, construction began in 1682, it was sanctioned by the Viceroy Tomas Aquino Manrique de la Cerda, and consecrated in 1690 by Bishop Isidro Siraña y Cuenca. Castillo spelling out, “Viva La Virgen de la Soledad” (Long live the Virgin of Solitude) and “Nuestra Senora de Oaxaca” (Our Lady of Oaxaca). 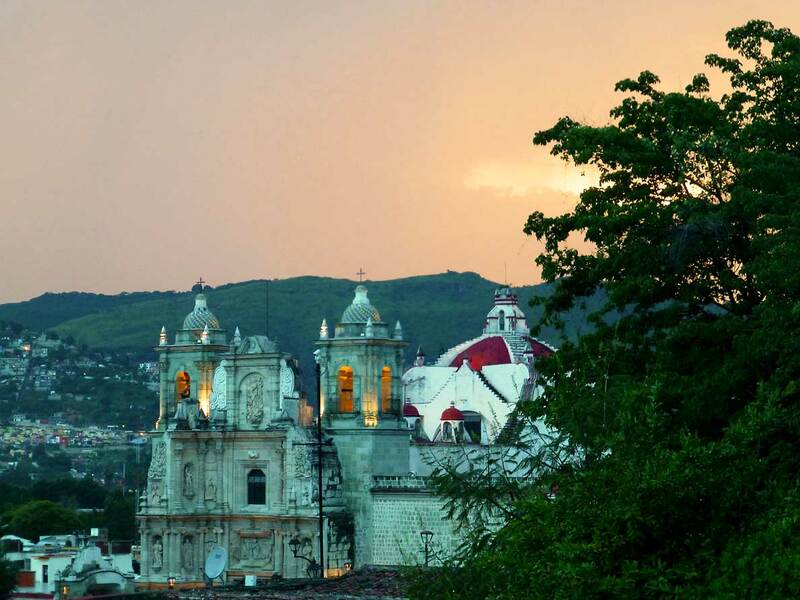 Being that this is Mexico and Catholicism is tempered (enriched) with indigenous practice, the night of December 17, after religious rites and rituals were performed at said Basilica, there were fireworks in the church atrium, including toritos and a castillo, in honor of La Reina de Oaxaca. 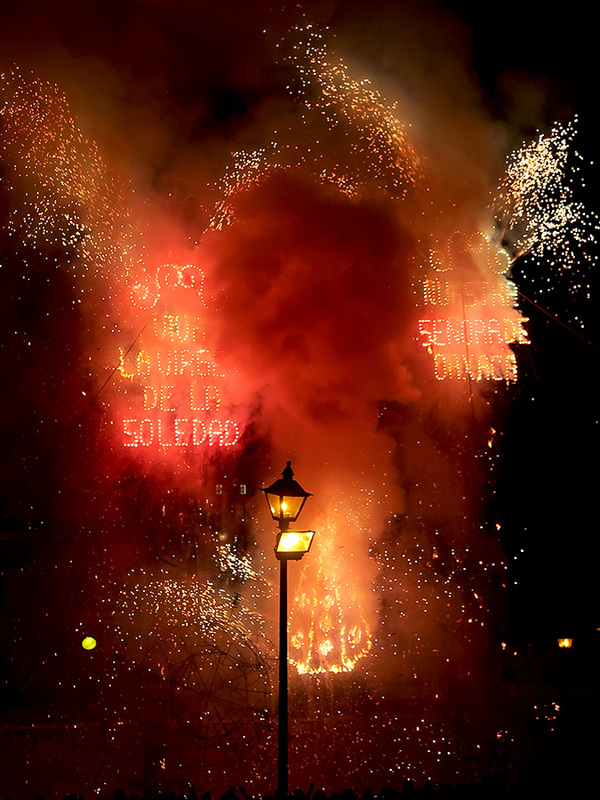 Despite the late hour, I managed to leave the comfort of my rooftop and head over to the Plaza de la Danza to watch — and they were spectacular, as always. Many of the faithful spent the night in the Basilica’s atrium. 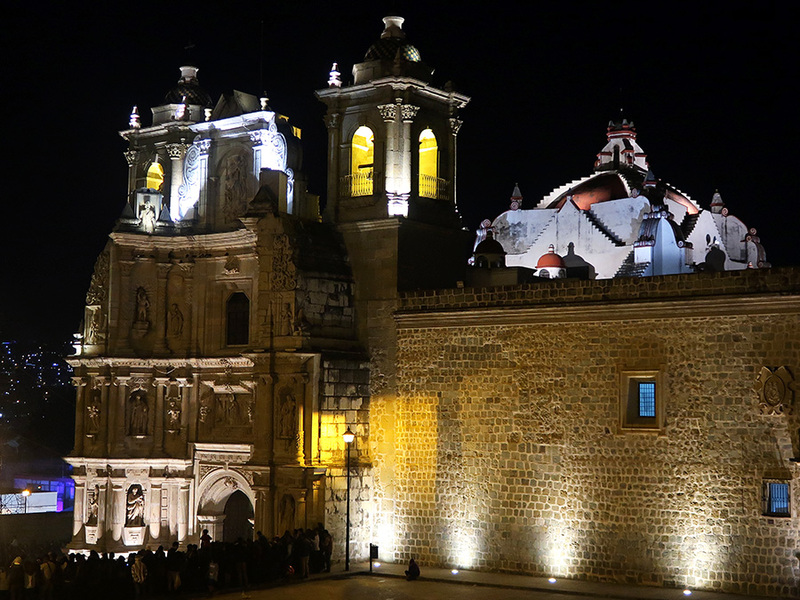 Alas, I didn’t have any energy left to stay and hear the Universidad Autónoma Benito Juárez de Oaxaca (Benito Juárez Autonomous University of Oaxaca) Tuna band serenade Soledad with a concert inside the Basilica at midnight. Silly me! I was dozing off to sleep at midnight when the Basilica’s bells began chiming furiously and cohetes (rockets) sounded and I woke with a start. Next year, I’m staying up! 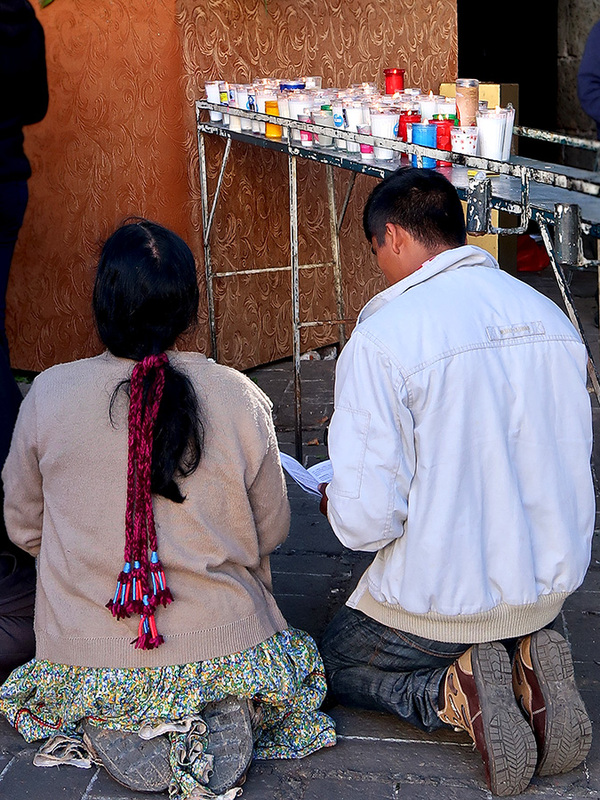 Prayers before the La Virgen de la Soledad. Sleep finally returned, only to be interrupted about 4:15 AM with more cohetes and a band and then again around 6:30 AM. Needless to say, I gave up on sleep and got up. 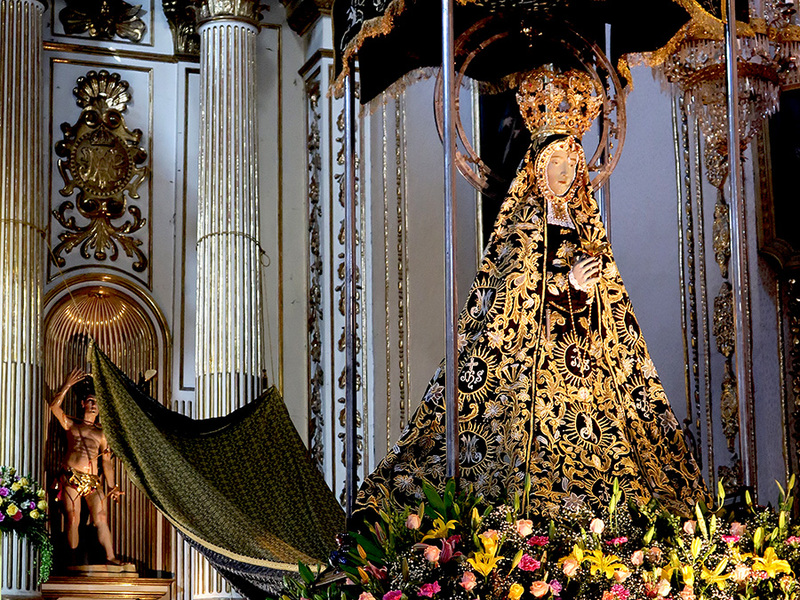 All during the night La Virgen was not alone. 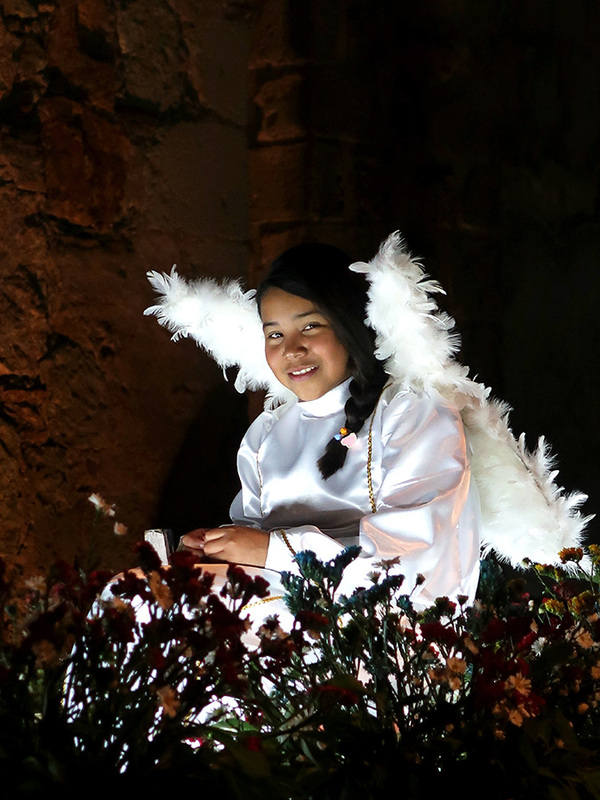 The faithful, coming from near and far, spent the night in the atrium of the church, food stalls set up on the stairs leading down to the church fed one and all, and live music entertained her all night long. 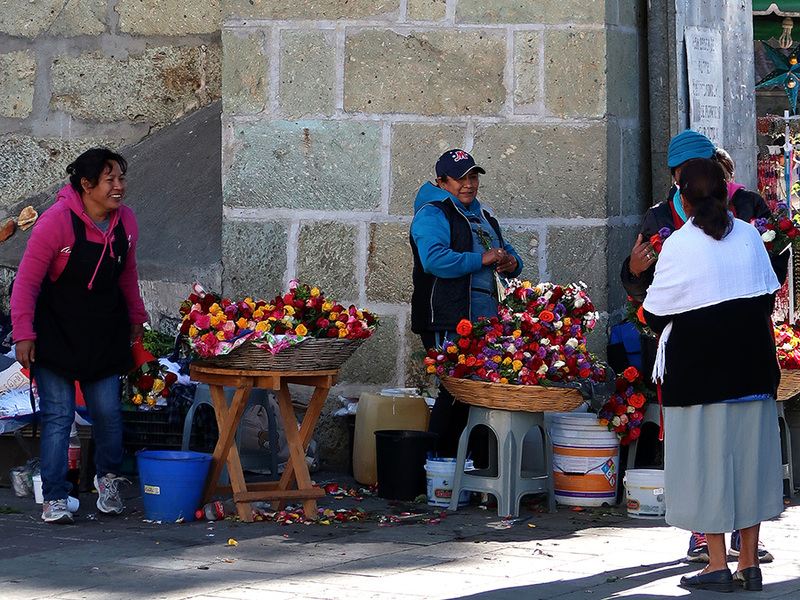 The ever-present vendors selling flowers to the faithful. Like most, her story has several versions. 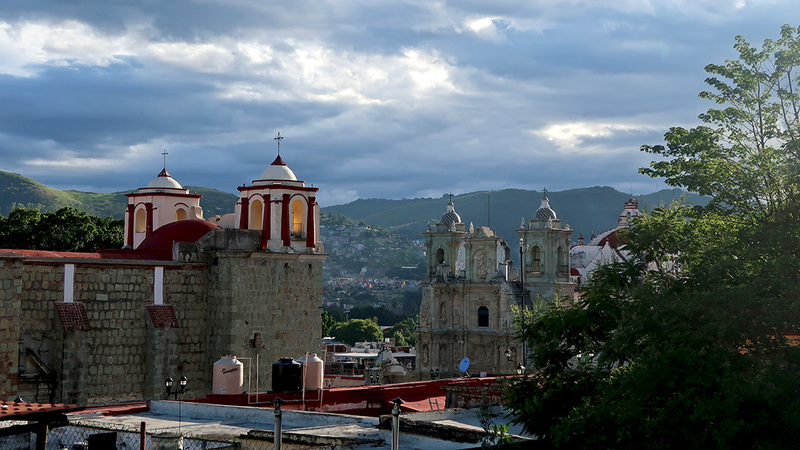 According to one legend, in 1620 a mule train bound for Guatemala camped outside the city of Oaxaca, discovered an extra mule which did not belong to anyone in the group. The mule refused to move and when prodded rolled over and died. 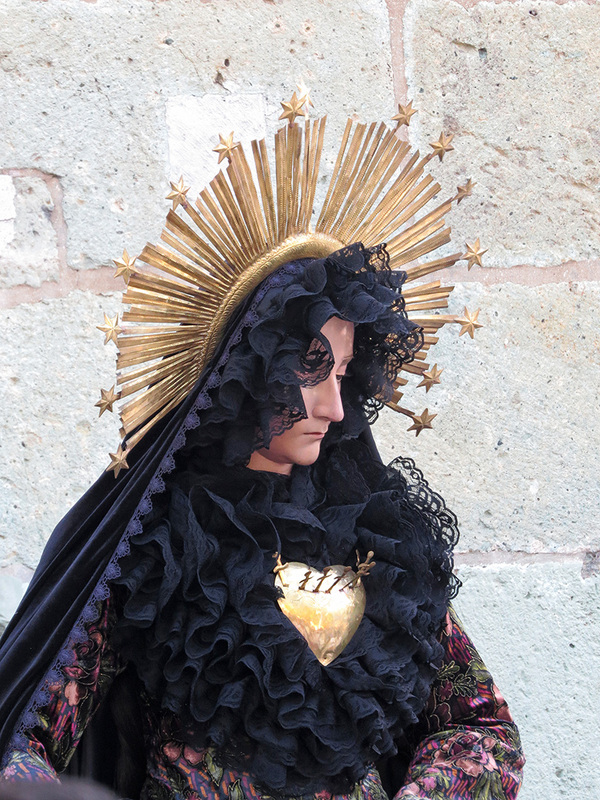 When the pack it carried was opened, it was found to contain the statue of La Virgen de la Soledad. Taking this as a sign from heaven, the inhabitants built a shrine, later a church, and finally the imposing Basilica. Food vendors lined the stairs down to the Basilica’s atrium. In another story, a muleteer from Veracruz, en route to Guatemala, noticed he had one too many mules in his pack upon his arrival in Oaxaca. 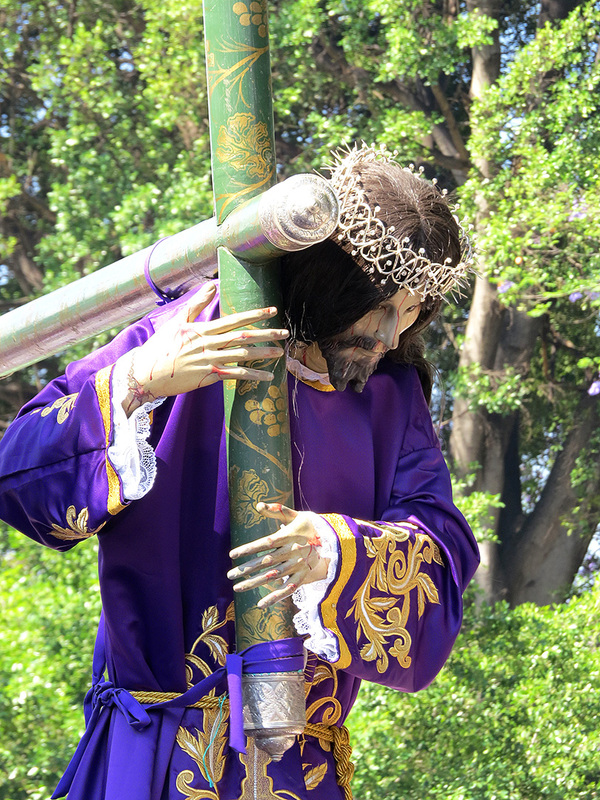 Outside the San Sebastian hermitage, the mule collapsed under the burden it was carrying. All attempts by the muleteer to get it back on its feet were futile; to avoid punishment, he notified the authorities. When he lifted the load off the mule, it got up but then immediate died. 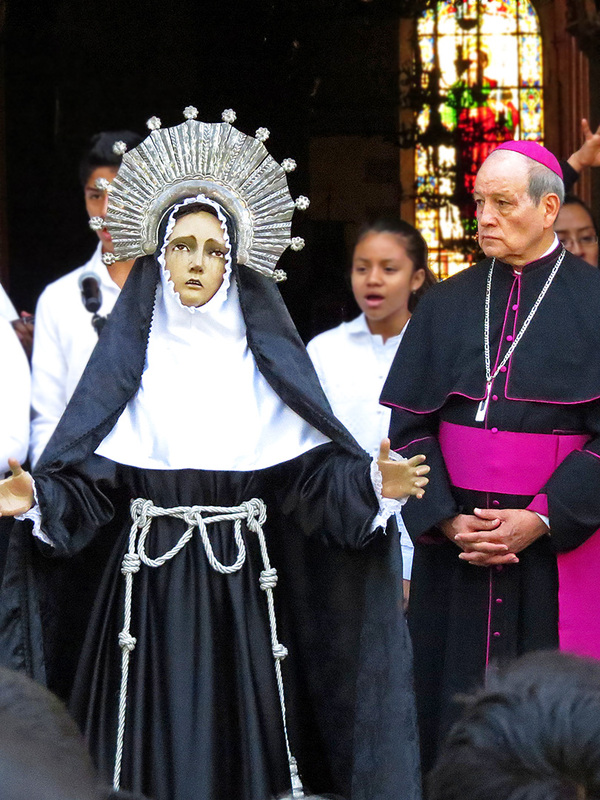 The burden was inspected and an image of the Virgin, accompanied by Christ, along with a sign that said, “The Virgin by the Cross.” Faced with this momentous event, Bishop Bartolome Bohorquez ordered a sanctuary to be built in honor of the divinity. 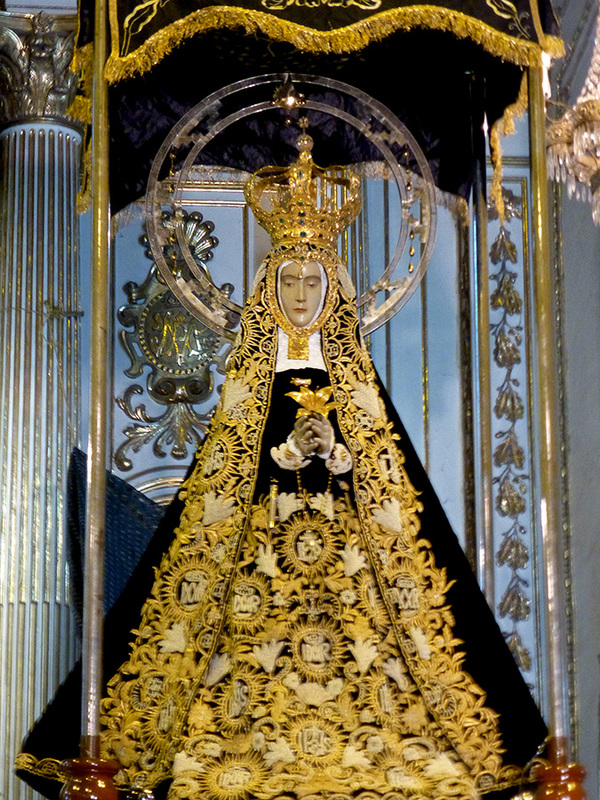 La Santísima Virgen de La Soledad inside the Basilica wearing her gold, diamond, and pearl encrusted vestments. 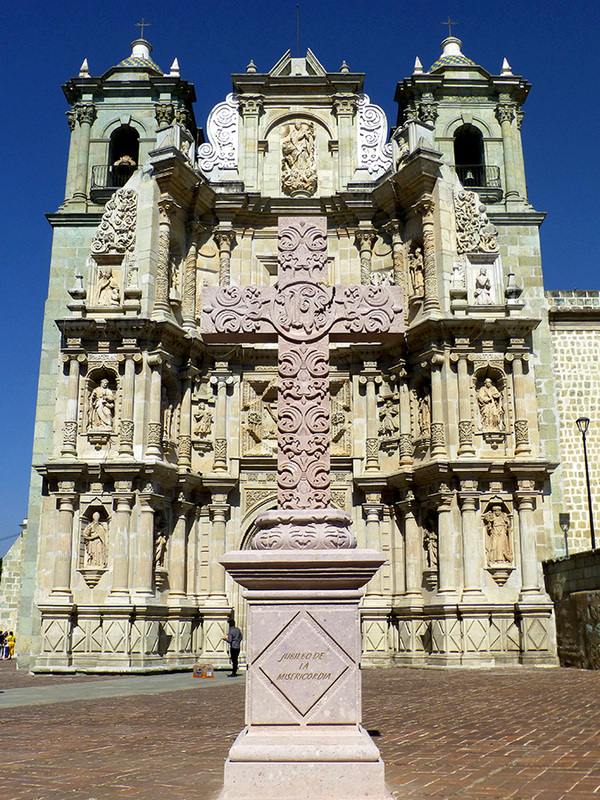 Still another legend: a heavily laden burro of mysterious origin appeared outside of town in 1534, fell to the ground, spilling its load next to a rock (still on-site) containing the beautifully carved Virgin (thought to be carved in Guatemala or the Philippines) and a chapel was built on the spot. 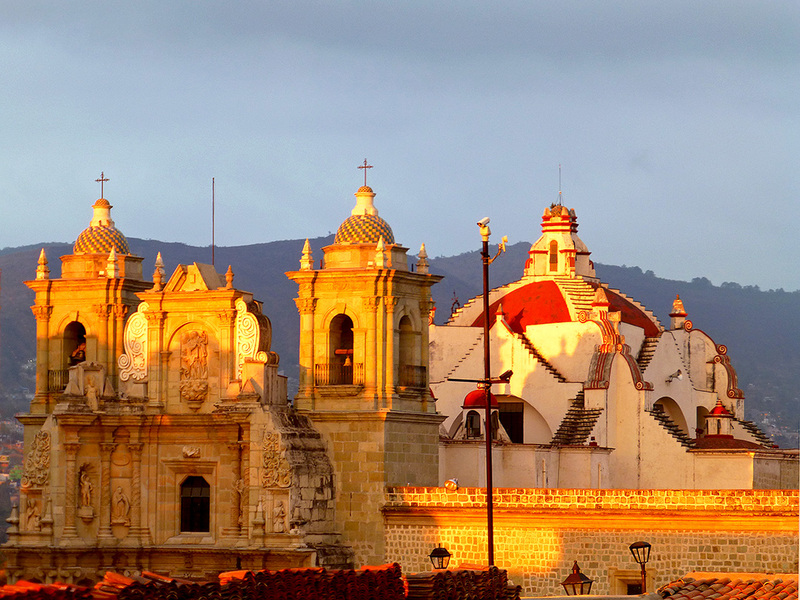 However, apparently there was an adobe shrine to the Virgin of Solitude atop Cerro Fortín as early as 1532 — and the rock may have even been moved from the mountain in 1617 to the current site (immediately to the right as you enter the Basilica). 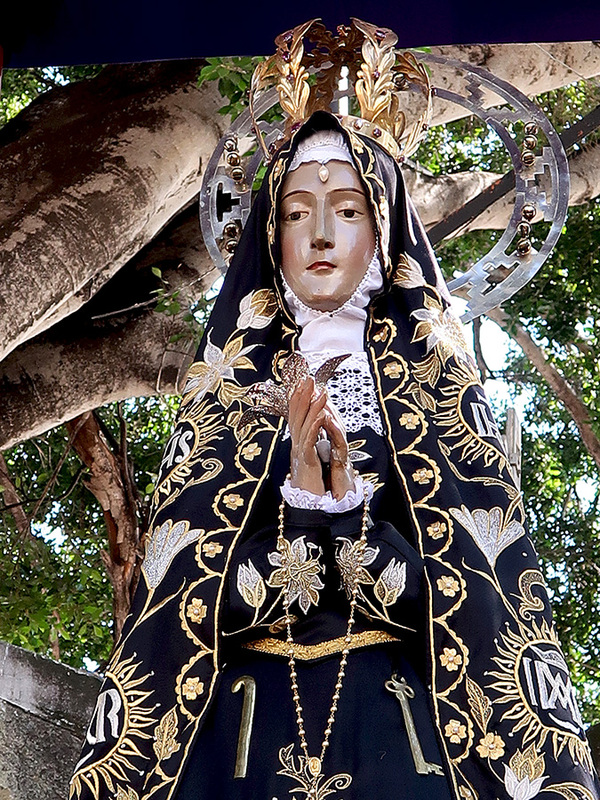 La Santísima Virgen de La Soledad (body double) under the tree in the atrium of the Basilica — wearing the traveling attire. 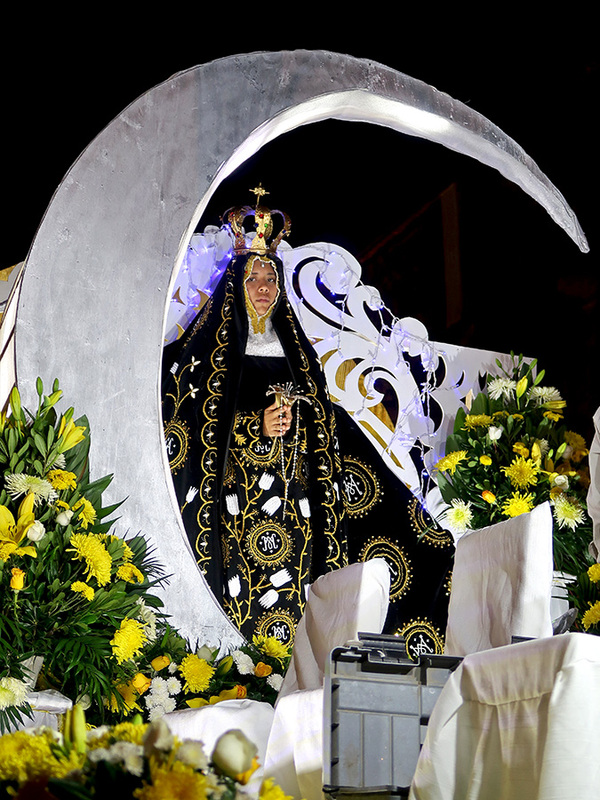 Her vestments are encrusted with pearls and 600 diamonds — and she wears a 4-lb gold crown. As all that bling is quite heavy and valuable, she has a body double who wears a velvet mantle and crown that aren’t quite so ostentatious. 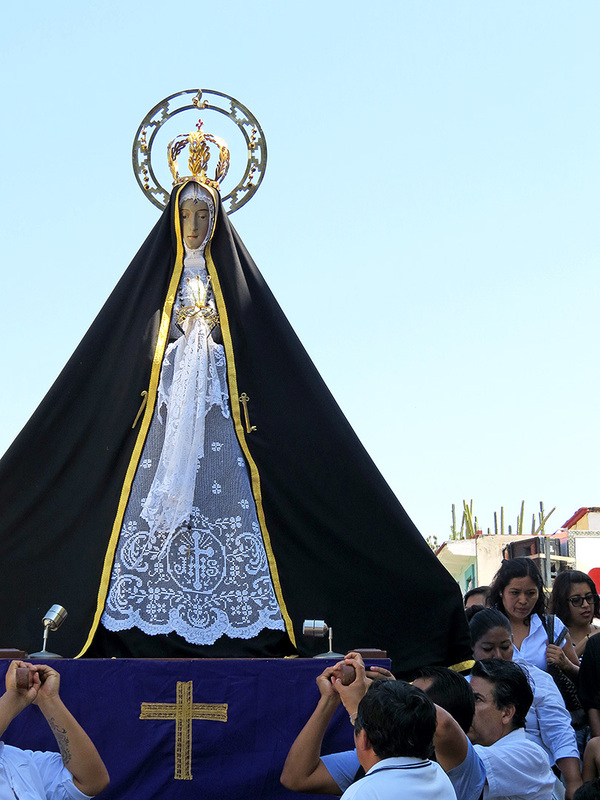 It is she who is carried through the streets during processions and has been residing in the church atrium during the festivities in her honor. 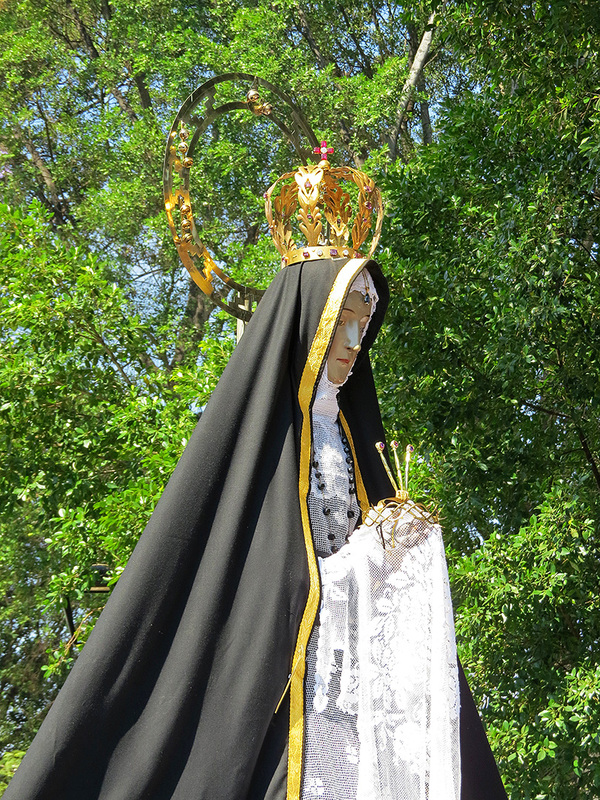 Cuadrilla de mascaritas from Asunción Nochixtlán. 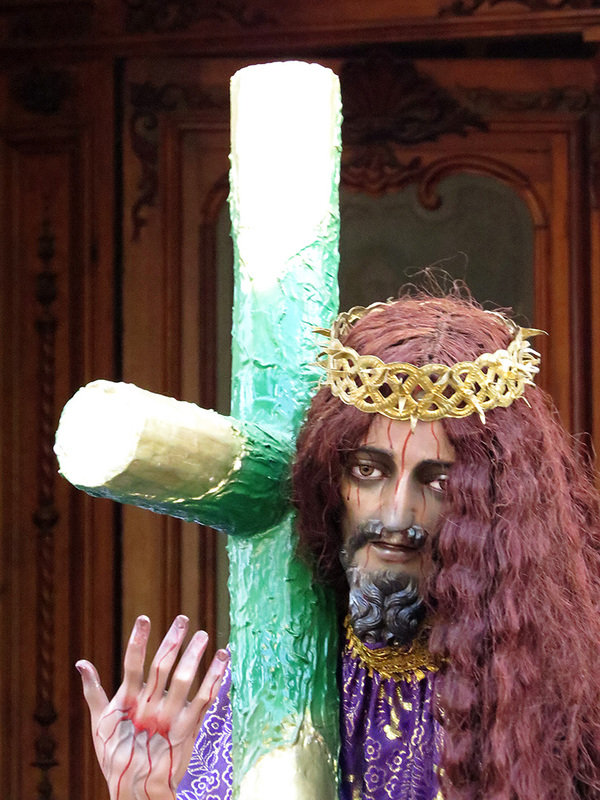 All was not completely serious yesterday at the Basilica — there was also entertainment. 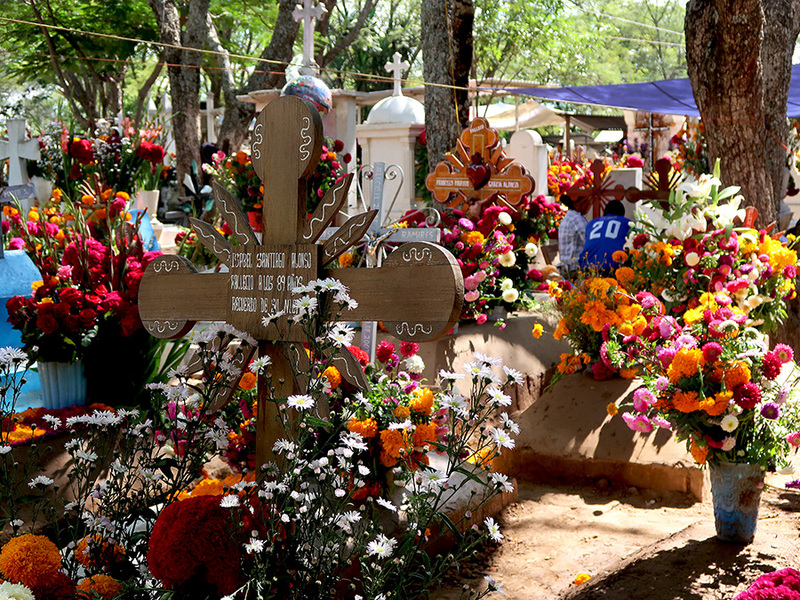 In the late afternoon, Soledad was treated to a command performance by the Cuadrilla de Mascaritas from Asunción Nochixtlán, in the Mixteca. I had never seen nor heard of this dance before. According to this article (in Spanish), in 1865, a year after the defeat of the Franco-Austrian army at Las Tres Cruces (between Santo Domingo Yanhuitlán and Asunción Nochixtlán) by the joint forces of the Mixtecs and General Porfirio Diáz, Mixtecos commemorated the victory with the mascaritas dance, which ridiculed the supposedly invincible enemy. I learn something new every day! 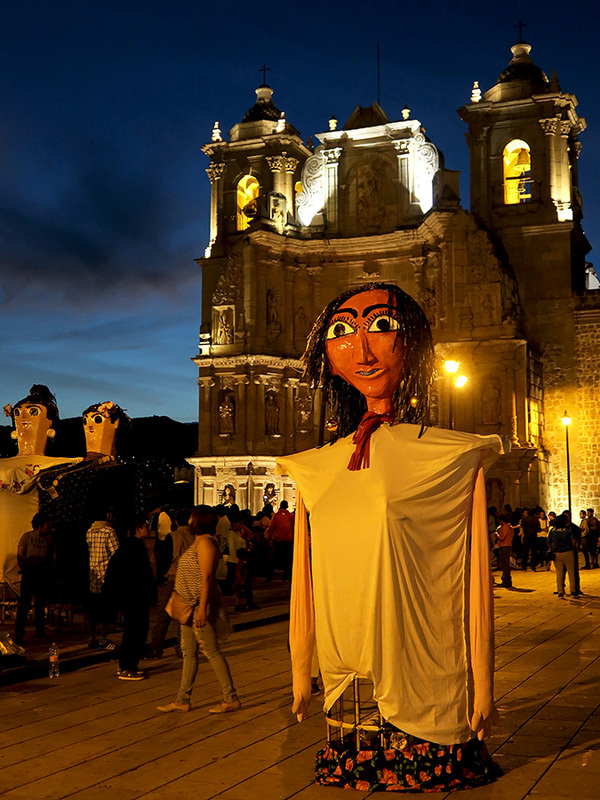 Tonight, the streets of Oaxaca are alive with the sound of music and cohetes (rockets) as a calenda (parade) in honor of Nuestra Señora de la Soledad (Our Lady of Solitude) celebrates the approach of the feast day of the mother, queen, and patroness of Oaxaca. 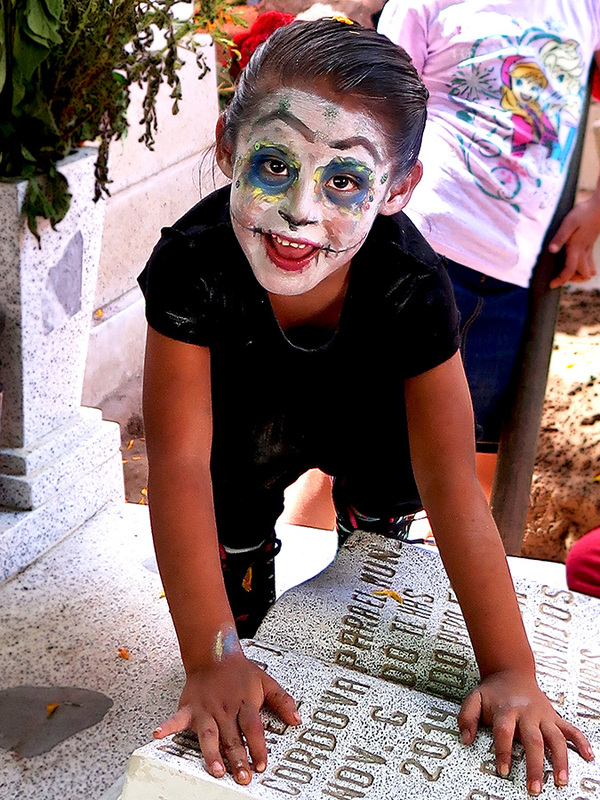 A young Soledad making the rounds on a float. Monos taking a break in front of the Basilica de la Soledad. There will be no solitude for Soledad during the next couple of days and nights. If you don’t believe me, check out her festival schedule. 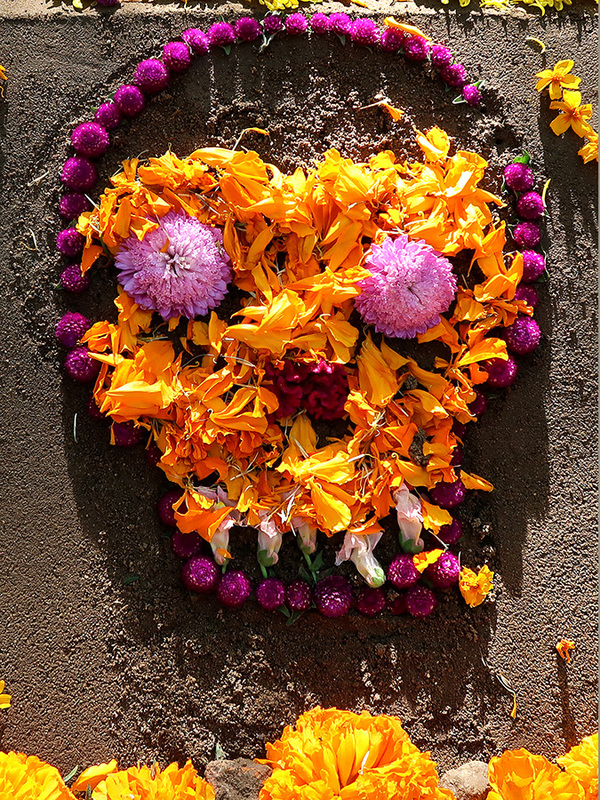 For anyone who still wonders why in the world I have chosen to live in and thrive in Oaxaca, go see the latest Pixar movie, Coco. 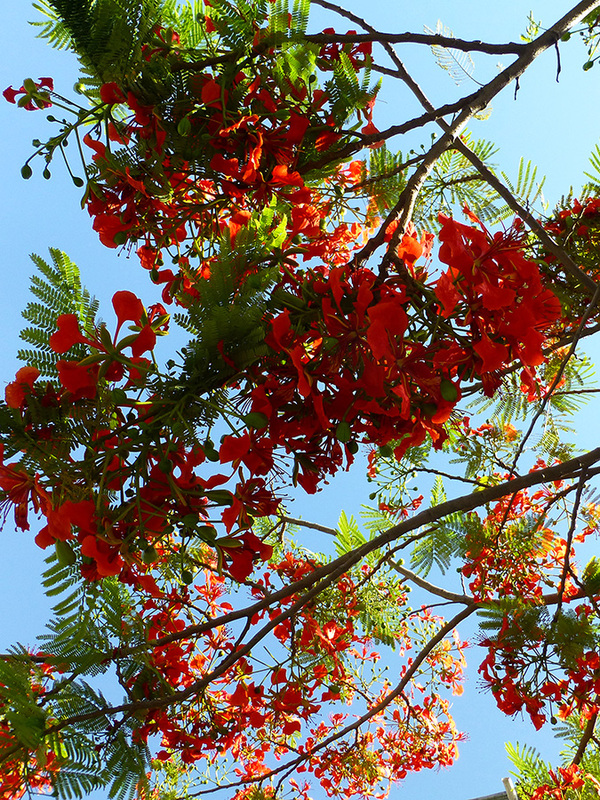 It is the music and messiness, color and cacophony, and finding joy in just being. 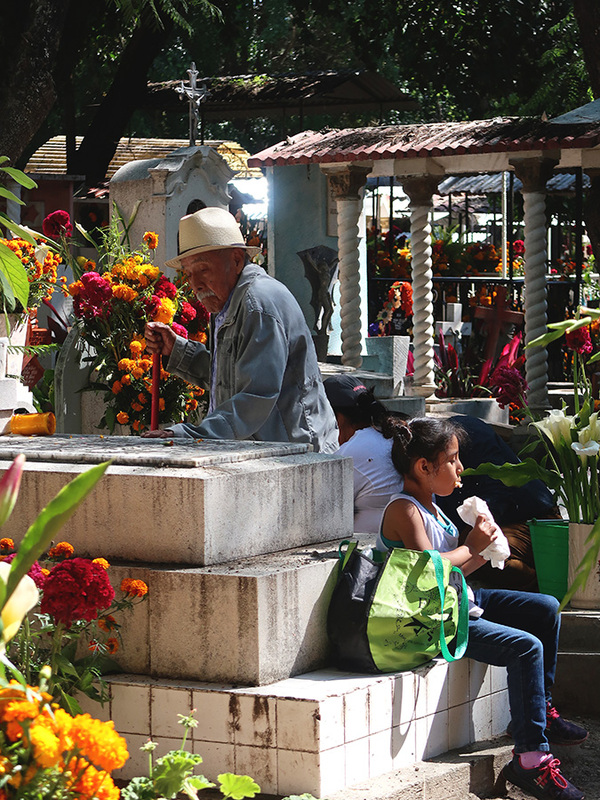 It is the Oaxaca of fiestas, street dogs, and papel picado. And, respect for one’s heritage and traditions. 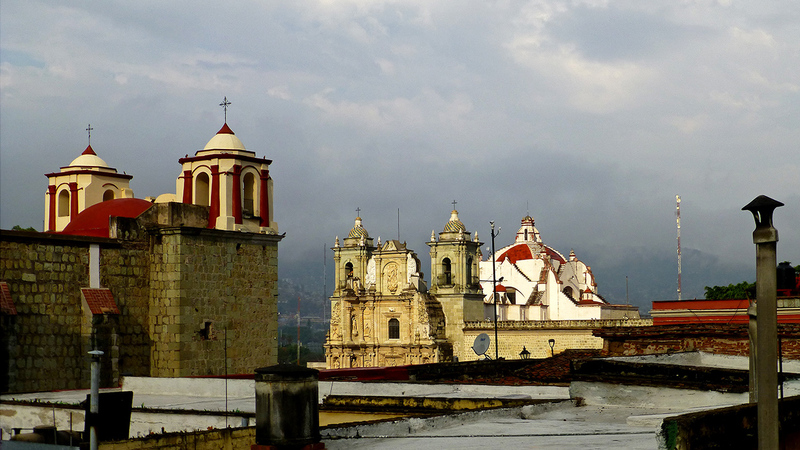 This is the Oaxaca I fell in love with and treasure. 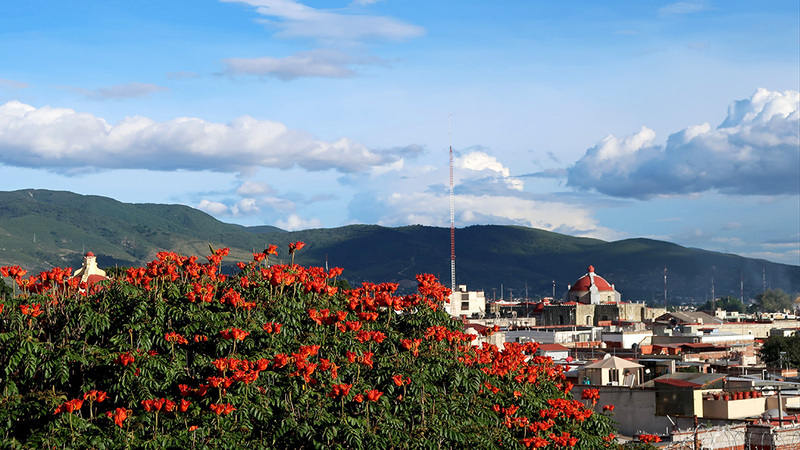 This is the Oaxaca that captured by heart, daily enriches my life, and I call home. 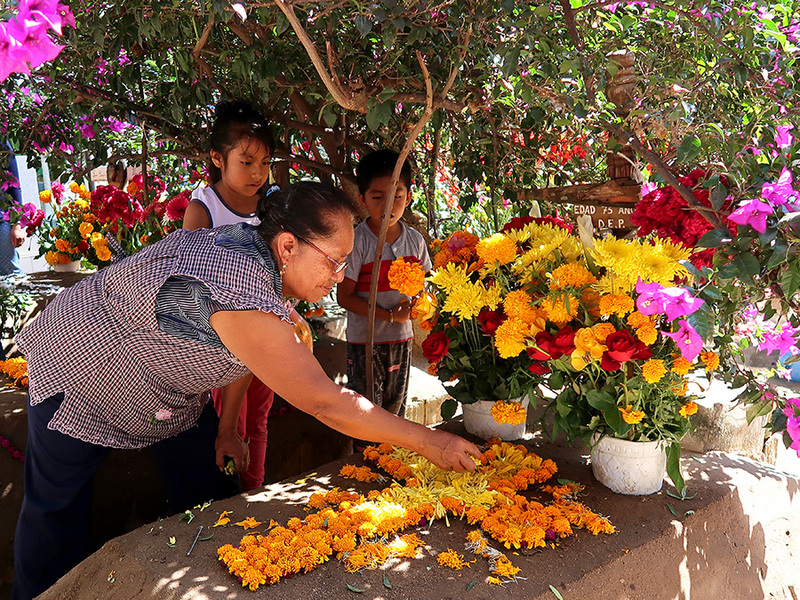 This morning, sun and blue sky welcomed the Solsticio de verano in Oaxaca — a beautiful way to begin the longest day of the year. 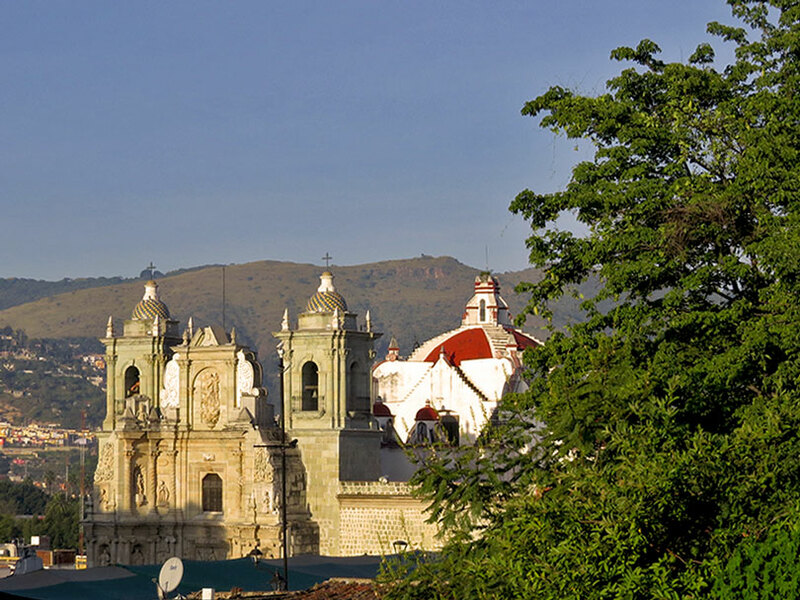 View from the terrace: Templo de San José, founded by the Jesuits in 1559, on the left; Basílica de Nuestra Señora de la Soledad (Basilica of Our Lady of Solitude), constructed between 1682 and 1690, on the right; and the green mountain in the far distance between the two is Monte Albán. 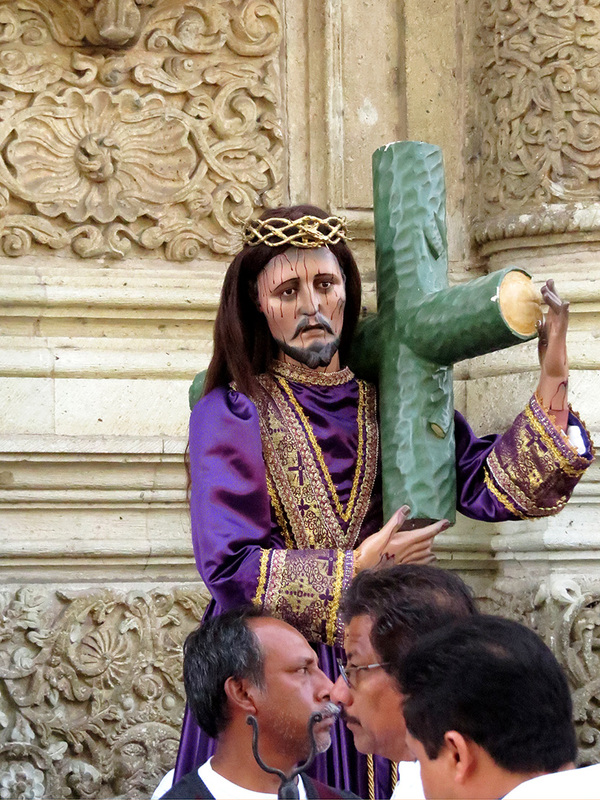 Jesus and Mary up close and in color from their Viernes Santo (Good Friday) morning meeting in front of Oaxaca’s Cathedral. I know, some photos just beg for a caption. 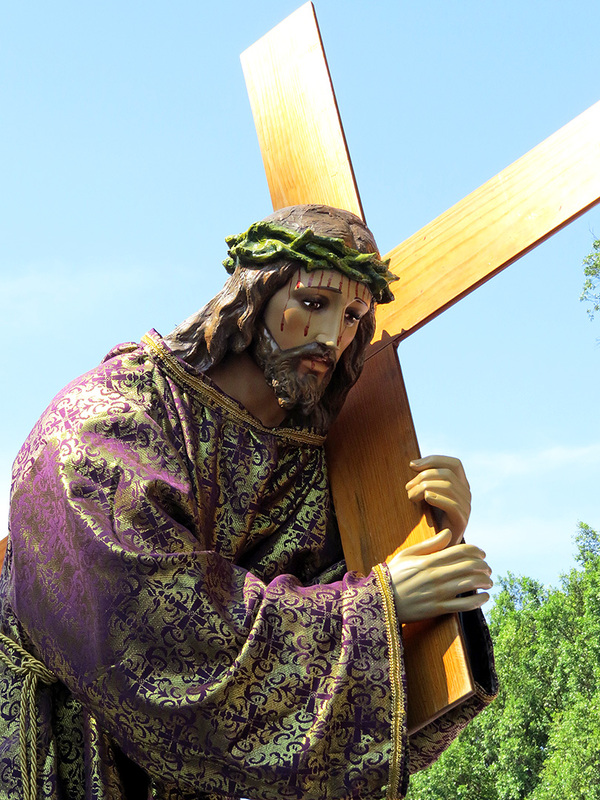 Once all the Marys and Jesuses had gathered, prayers had been recited, and rituals performed, they all processed back to their home churches to rest up for the evening’s Procession of Silence. … including Soledad. Since she was going my way, I walked her home. 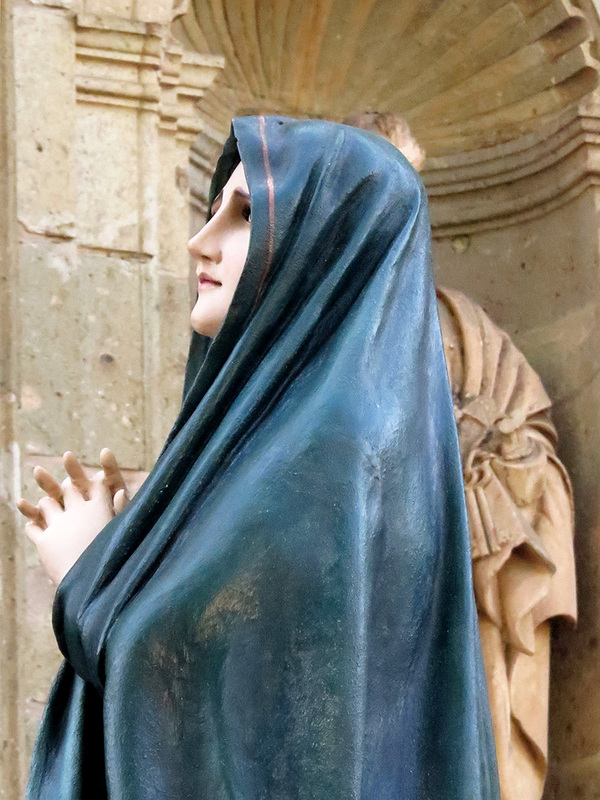 And, yes, she made it back to the Basilica safe and sound. 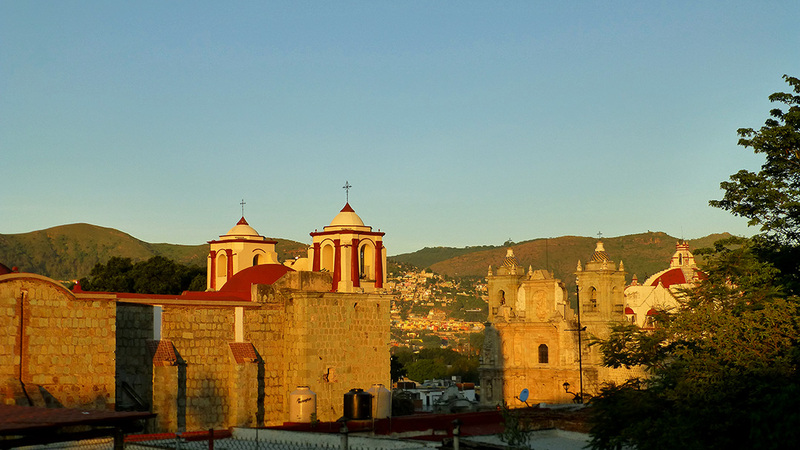 Yesterday, I opened my front door to the Basilica de la Soledad glowing in the morning light. I grabbed my little Lumix and ran out to compose a photo to send as a Feliz Cumpleaños greeting to a friend celebrating his birthday. 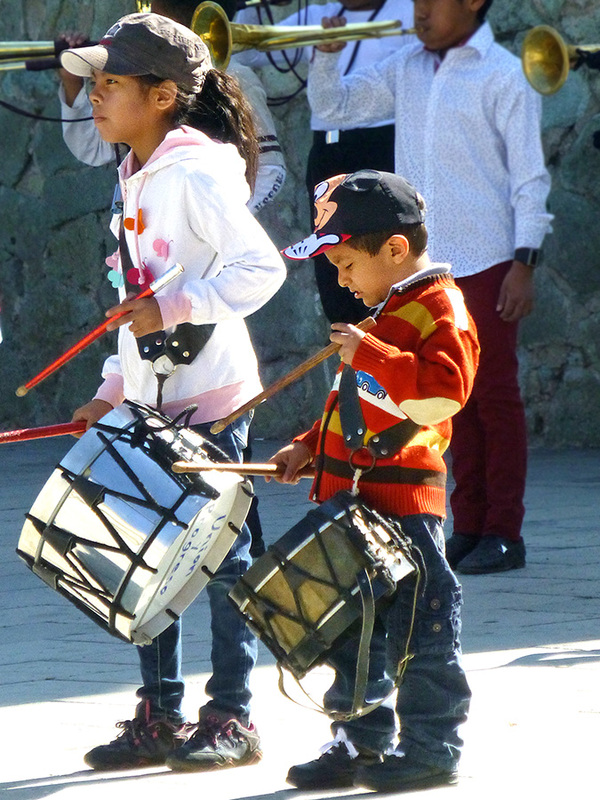 Tuesday morning, from the plaza in front of the Basilica de la Soledad, the sound of speeches, music, and explosions announced Día del Barrendero — a day celebrating the founding of the Sindicato Independiente 3 de Marzo. 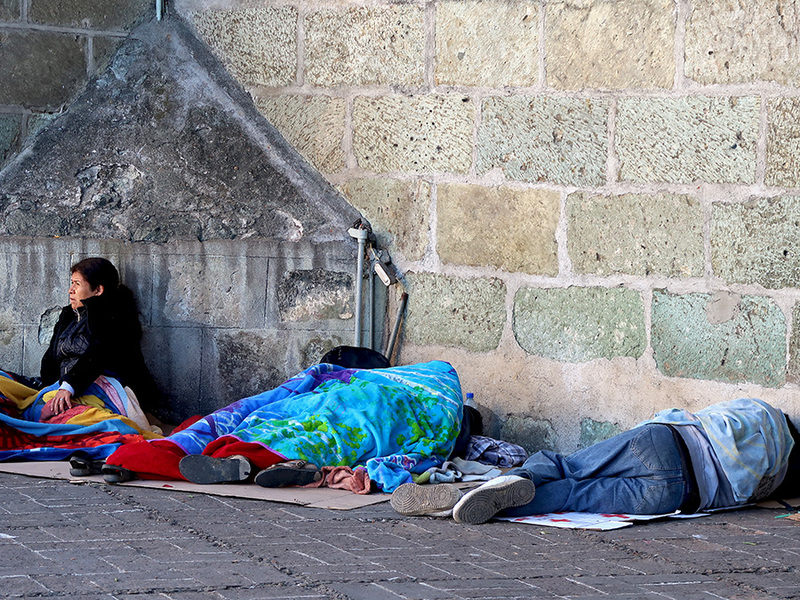 These are the street sweepers, garbage collectors, and laborers of Oaxaca. March 3rd — brought to you by the gals and guys who keep the city clean. As if Thursday’s Thanksgiving of 2 turkeys, 2 styles of stuffing, 2 kinds of cranberry sauce, 2 types of potatoes (sweet and garlic mashed), and 2 desserts (pumpkin pie and chocolate cake) weren’t enough…. 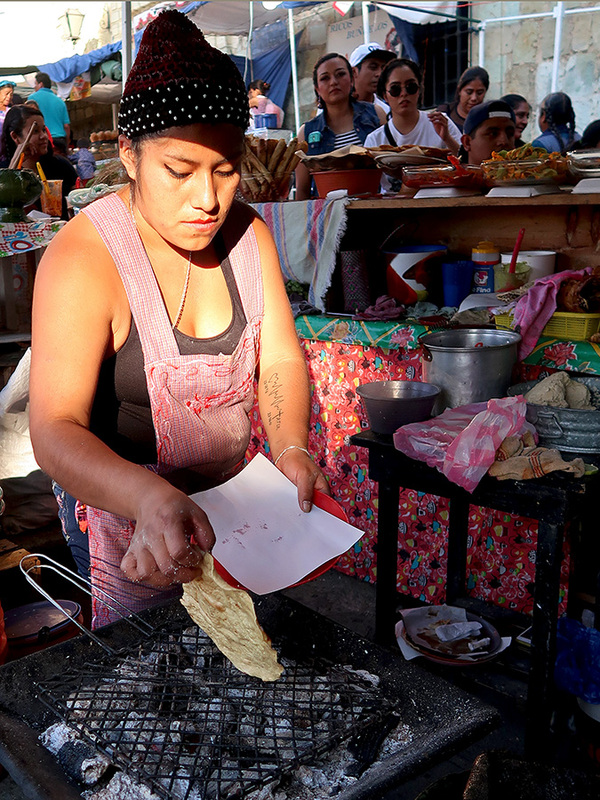 Believe it or not, Friday night, eating was again on the minds of neighbors (and co-Thanksgiving Day cooks) David and Marilyn and I, as we walked over to the Plaza de la Danza for the kickoff cena (dinner) of Oaxaca’s annual El Saber del Sabor gastronomy festival. The transformation of the Plaza de la Danza began on Wednesday. By Friday night’s dinner, it had morphed into an elegant banquet hall, with an open air rotisserie pit. 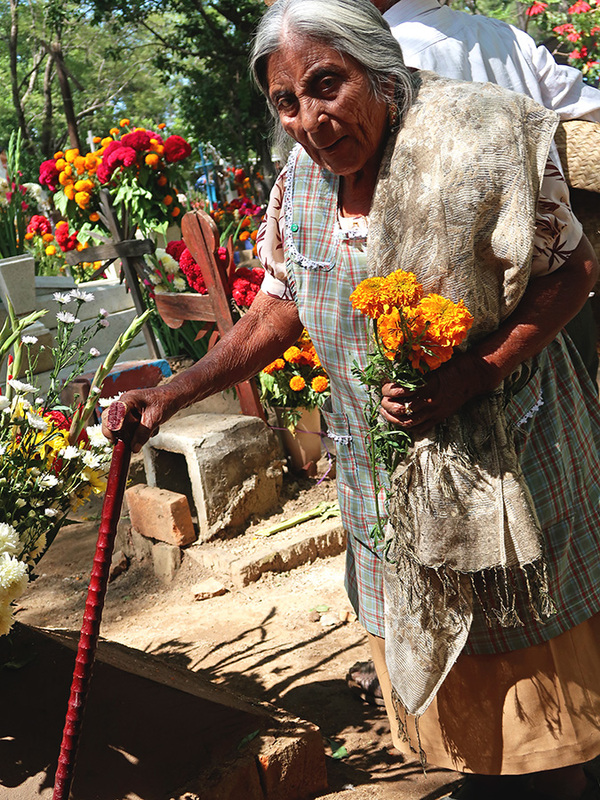 Fifty traditional cooks from the eight regions of Oaxaca offered guests a sample of the culinary wealth of the state. The results were dazzling and delicious. All for only 300 pesos (a little over $20 US)! 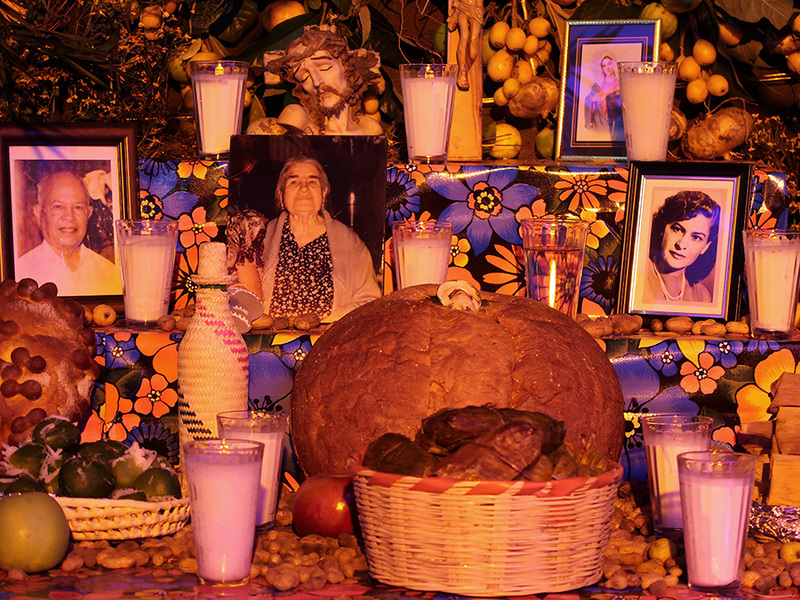 On a clear cold night, with the Basílica de la Soledad looming above, there was also mezcal and music to warm body and spirit! 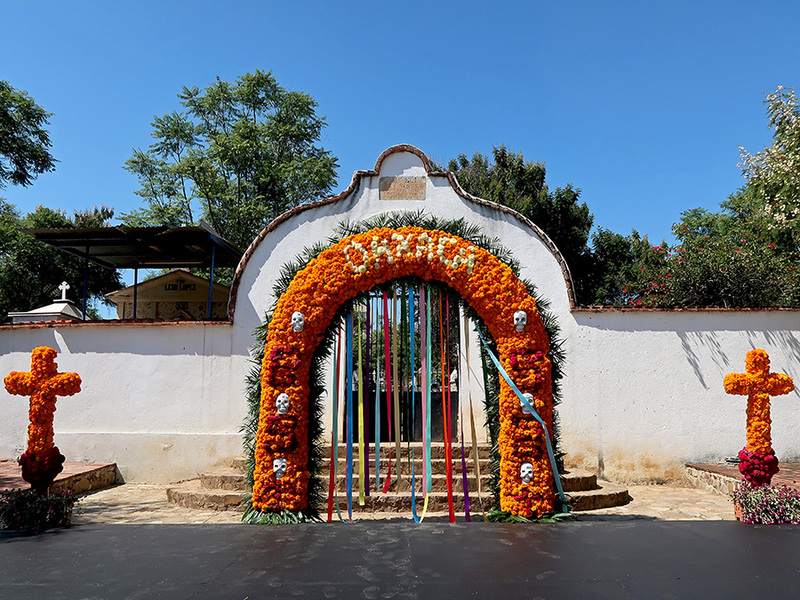 Following Thursday night’s inaugural banquet, the festival moves to Oaxaca’s upscale restaurants and other venues where, along with workshops and lectures, seventeen renowned chefs from around Mexico will be offering specially created gourmet menus. El Saber del Sabor closes tomorrow afternoon with a tribute to chef Pedro Ortega of Grupo Estoril, accompanied by a comida prepared by Ortega and three other distinguished chefs. Yummm… Alas, at 1500 pesos, it’s a little too pricey for me. 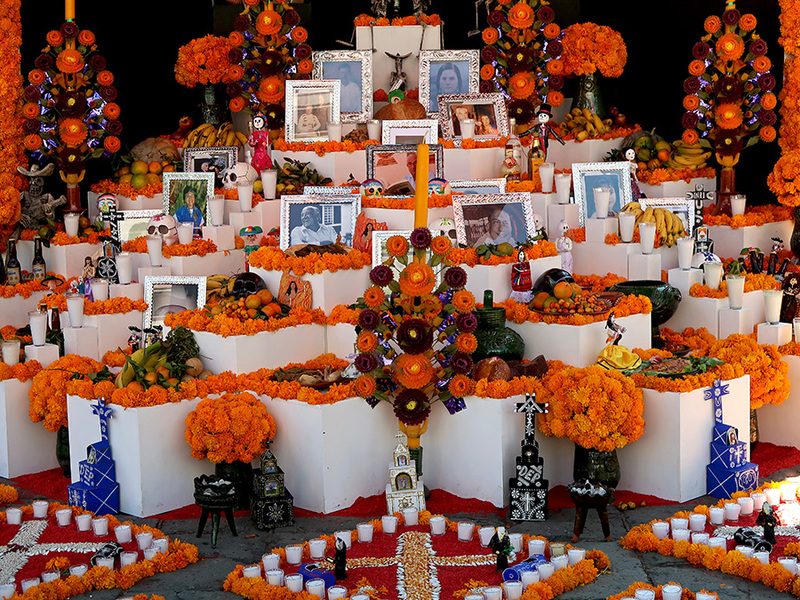 In previous years, El Saber del Sabor was held in late August and early September. I don’t know why this year it was moved to the end of November, but I do know Friday night was a little chilly for an outside venue and, for gringos, it was way too close to Thanksgiving — the gluttony was almost (but not quite) too much! 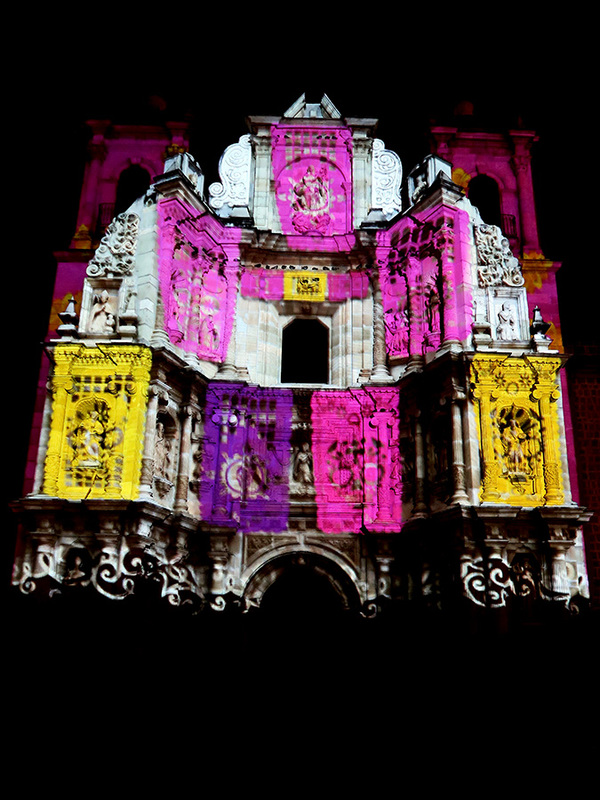 As a treat for residents and visitors during the Muertos festivities, last night and tonight, the City of Oaxaca is presenting, “Manjares de Todos Santos” — a video mapping light and sound show at Santo Domingo de Guzmán and the Basílica de la Soledad. 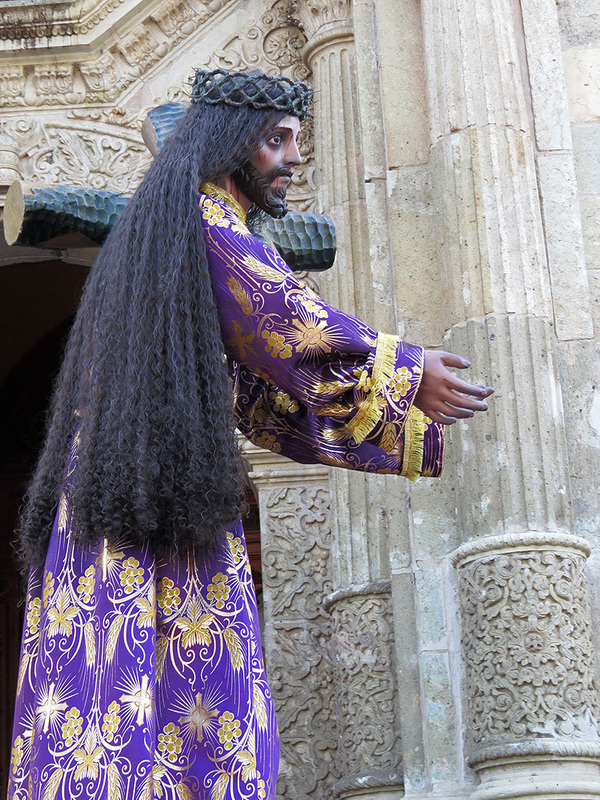 Last night was a mob scene at Santo Domingo, so we opted for Soledad, where we had a ringside seat. The calm after the storm. What a difference 36 hours makes! 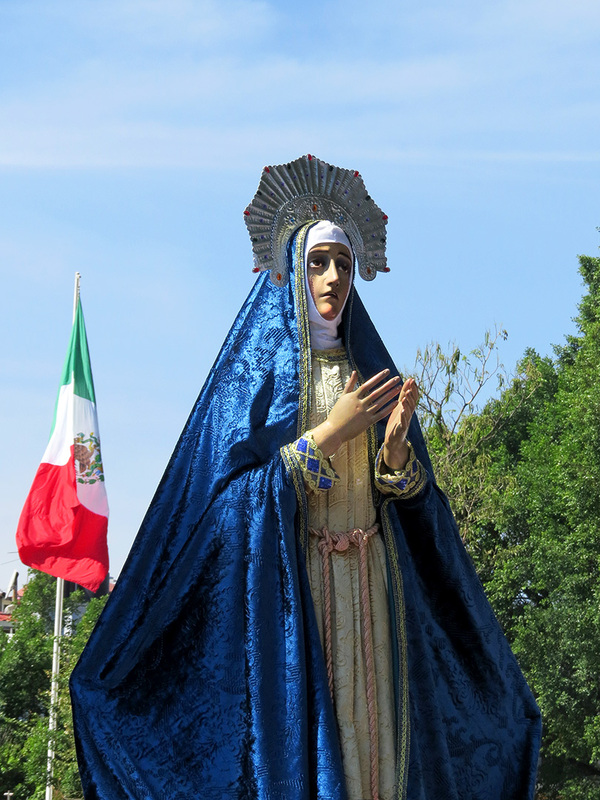 Yesterday, the Virgen del Rosario convite beckoned us to Tlacolula (more to come). After an hour and a half of photographing and relishing in the music, marmotas, monos, impossibly cute kids, and hospitality, we began losing the light as a dark and threatening sky began moving in. However, Mother Nature put on quite an extravaganza for our drive back to the city — towering clouds, sheets of rain, lightening streaking towards the ground, brilliant sun, and rainbows. Once home, a weird and wondrous sunset.